Charles Lindbergh (1902–1974) was an American aviator best known for making the first solo transatlantic flight. He was politically active from the late 1930s, a strong advocate of American isolationism and the preservation of the white race, and a fierce opponent of communism; he has been accused of support for Nazi Germany and Hitler. He also worked as an inventor, designing the perfusion pump, an early type of artificial heart. In 1932 his 20-month-old son was kidnapped, creating a national obsession and leading to a variety of conspiracy theories, false confessions, and confusion about the fate of the boy and identity of his captors. Richard Hauptmann was executed for the kidnapping and murder in 1936. His wife Anne Morrow Lindbergh was herself a talented aviator and bestselling author of Gift from the Sea (1955). 2 "I'm the Lindbergh baby!" He was born in Detroit, Michigan in 1902. His father was a Minnesota congressman from 1907-17 and opposed US entry into World War One; his mother was "so hot-tempered and self-dramatizing that she once held a revolver to her husband's head and may have failed to pull the trigger only because her weary target told her to go ahead and shoot". The family moved around a lot, but a boyhood interest in mechanics and science led him to flying. He trained in the United States Army Air Service in the 1920s before becoming an air mail pilot in the midwest. The first transatlantic flight was made as early as 1919 by Alcock and Brown who flew from Newfoundland to Ireland, but around the same time the French-American hotelier Raymond Orteig offered a prize for the first flight from New York to Paris. This was a significantly longer distance and the prize remained unclaimed for many years. With only modest funding from St Louis businessmen, Lindbergh made the flight successfully in 1927 and claimed the prize. This led to enormous fame and popularity. On March 1, 1932, his son Charles Jr was kidnapped from their home in New Jersey. A ransom of $50,000 was demanded and paid on April 2, after negotiations in which John F Condon ("Jafsie"), a retired schoolteacher, acted as an intermediary. Condon was the only person to have seen one of the kidnappers. However the child was not returned, and his body was found on May 12 near the kidnapping site. A German immigrant, Richard Hauptmann, was arrested after being found with around $14,000 of the ransom money. At the trial, the prosecution produced evidence that the ransom note matched Hauptmann's handwriting and that a ladder found at the crime scene matched wood in Hauptmann's home. However there were no fingerprints found, and Hauptmann denied all involvement. Nonetheless, thanks in part to anti-German sentiment and a drunken defense lawyer, Hauptmann was convicted and then executed in 1936. Jim Bahm in his book Beneath the Winter Sycamores suggested that Lindbergh had secretly sent the child to be raised in Germany because he was disabled. Gregory Ahlgren in Crime of the Century: The Lindbergh Kidnapping Hoax claimed that Lindbergh had accidentally dropped and killed the boy. More than 200 people confessed to the crime, an extreme example of the phenomenon of false confessions. Eugene and Robert Zorn from New Jersey investigated the case, the latter writing Cemetery John (2012), which claimed there was a small conspiracy around the kidnap, which centered on John Knoll, nicknamed "Cemetery John" because he collected the ransom money from a cemetery. John's brother Walter Knoll and Richard Hauptmann were also involved, according to Zorn. In 2016, a retired insurance man from Santa Cruz, California, also known as Paul Husted, claimed to be the Lindbergh baby, secretly disposed of by Lindbergh and Al Capone because of a physical deformity, "crossed toes". Abraham Simpson was the Lindbergh baby. Lindbergh at an America First rally. 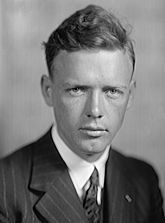 Lindbergh was a key figure in advocating for isolationism before World War Two, particularly in the America First Committee founded in 1940 (whose 800,000 supporters ranged from a young Gerald Ford to those on the far left; Henry Ford was a member but was expelled for his antisemitism). He believed the US should let Hitler conquer eastern Europe and defeat communism. He said the US should join with Germany and Britain to form a "Western Wall of race and arms which can hold back either a Genghis Khan or the infiltration of inferior blood." His exact relationship with Nazism is contested. He was a keen admirer of Germany, having lived there in the 1930s with his family (he left the US after the media circus over his son's kidnapping), and he praised Nazi Germany's order and dynamism. Comparing Germany's order with what he perceived as the chaos of 1930s America, he questioned democracy: "it takes the sweetness from the freedom of democracy and makes one wonder where freedom ends and disorder begins." He was greatly worried about the decay of the white race, saying the people of the West "can have peace and security only so long as we band together to preserve that most priceless possession, our inheritance of European blood." So deep does Mr. Lindbergh's anti-Semitism go that he can look upon a world in which almost half the human race has suffered intolerable outrage against its independence and dignity, and decide that somehow the chief villain in the piece is the Jew. This is no shallow, surface anti-Semitism, no mere petulance or passing bar-room anger; this is a deep, dark, mystical current, Teutonic, if not in inspiration, quite obviously in coloration and content. Even the anti-FDR pro-isolationist Hearst newspapers condemned Lindbergh and called his speech “un-American”, and his home town removed his name from its water tower. Unlike many prominent pro-Germans he wasn't interned after Pearl Harbor; he was keen to aid the war effort and worked as a consultant for aviation companies and as a trainer for the Air Force before being allowed to fly combat missions in the Pacific theater in 1944. After the war, he worked in various capacities for the US Air Force and Pan Am, and his pioneering voyage was recalled at the time of the Apollo moon landings, Lindbergh joining Walter Cronkite to comment on the Apollo 11 mission. He was also involved in conservation of endangered species, particularly in the Philippines, and campaigned for protection of indigenous peoples in the Philippines and Africa, including the Maasai. He died of lymphoma on Maui on August 26, 1974. Lindbergh had three children by a German woman in the 1950s and 1960s. He kept it secret at the time, being married to Anne Morrow Lindbergh back home, but it was proven by DNA tests in 2003. As a private man who often sought to protect his family from media attention, Lindberg does not appear to have had a desire for political office. In 2004, Novelist Philip Roth imagined in an isolationist, fascist America where Lindbergh was elected president in The Plot Against America. Roth's alternative history has Lindbergh sweeping into the presidency using demagoguery and an "America First!" message. He gets along just fine with dictators like Hitler and Hirohito, but his supporters say that's a good thing. ↑ 1.0 1.1 1.2 See the Wikipedia article on Charles Lindbergh. ↑ 3.0 3.1 3.2 3.3 See the Wikipedia article on Lindbergh kidnapping. ↑ See the Wikipedia article on Cemetery John.